Humans have lived in this part of the world for at least 12,000 years. The first people who entered this area left evidence of their existence on the bones of mastodons. Between 50 and 75 sets of bones from both mastodons and mammoths have been found throughout the Greater Chicago area. * Some show the cutting and scraping marks left by the stone tools of these pre-historic people as they cut the meat from the huge animals. Some of the oldest evidence of humans in North America is in Kenosha, Wisconsin where the butchered remains of a woolly mammoth were found by the staff of the Kenosha Public Museum. The mammoth’s bones have been dated to a little over 12,000 years ago making this discovery one of the earliest pieces of evidence of human activity in the Midwest. When humans started inhabiting this area, they found it was easier to walk along the edges of the old beaches which gave them a long view of the previously submerged land that was about 20 feet lower than the beach trail. Trails also connected the seasonal population centers, ran alongside the rivers and skirted obstacles like Mud Lake. 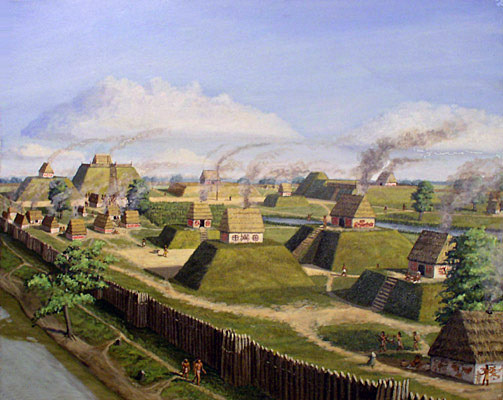 By the time the first Europeans arrived, these trails were well established and several converged in the area around the west end of the Chicago portage. * Watch “Prehistoric Chicago” on the Discovery Channel website to see a mastodon dig in a DuPage County Forest Preserve.